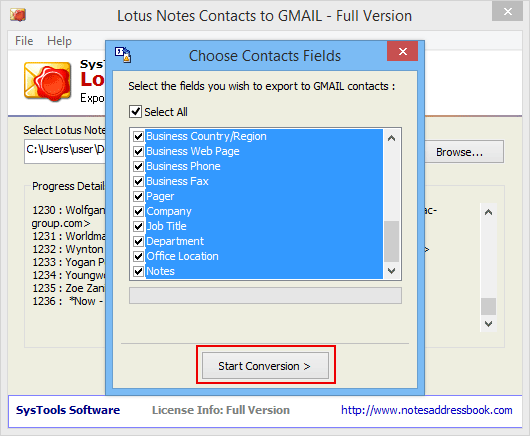 Get the tool to convert Lotus Notes NSF file contacts into CSV for Gmail contacts. With the featured product, you can share the contacts with information fields maintained in them to a Google mail compatible CSV file. 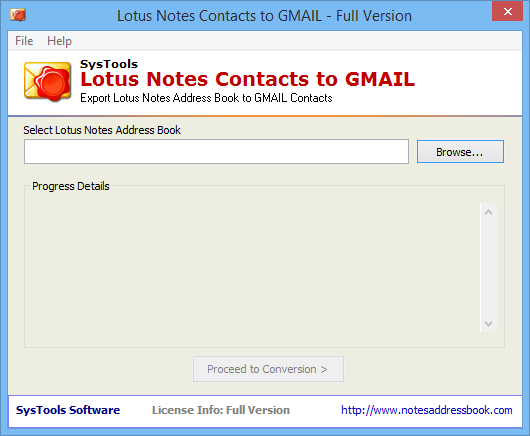 Convert Lotus Notes address book into Gmail contacts unlimited without encountering any failure. IBM Notes contacts are converted with all attributes and properties into Gmail via CSV. The software is programmed to support converting contacts with all associated information and attributes maintained throughout the conversion to Gmail CSV. Get the conversion of unlimited contacts carried out from Notes to Gmail successfully. Fully tested, the software has converted more than 10,000+ contacts from Lotus Notes. You can easily convert as many contacts as possible with it. A preview of contacts from the processed Notes names.nsf file is generated on software panel. 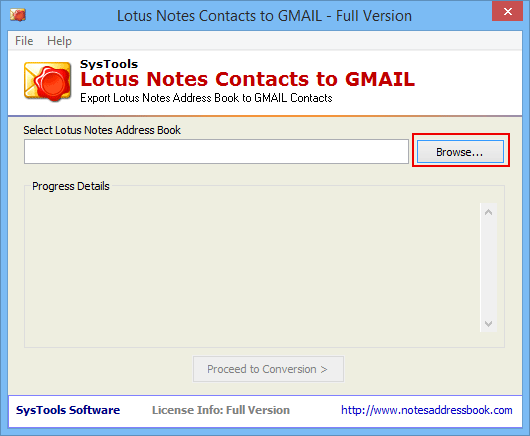 You can have a look at the information stored within the address book before proceeding to migrate Lotus Notes NSF to Gmail. When proceeding with the conversion of Notes contacts to Gmail, users can choose the fields as per their preference. The software features an option to select/deselect fields to customize the contact conversion process of Notes to Gmail CSV. 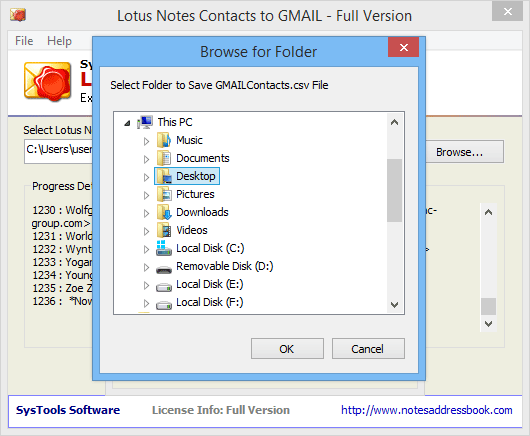 You need to get Lotus Notes Contacts to Gmail transport application. We feature a bundle of options to not just simplify but also speed up the procedure to transfer Lotus Notes contacts to Gmail. The simple user interface ensures that you will not require technical assistance to work on the application. 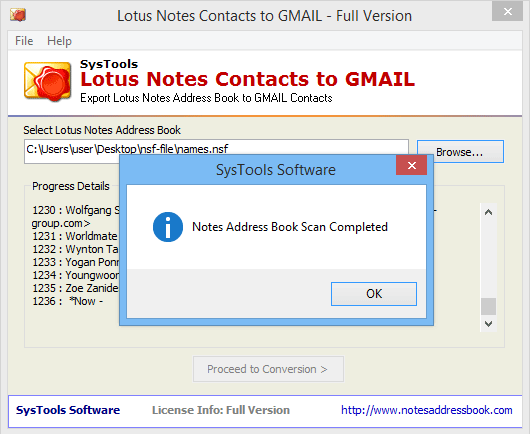 Lotus Notes Address Book to Gmail is a dependable tool that features all the right options for you to carry out contacts conversion. When you transfer Lotus Notes contacts to Gmail contacts, the application creates a CSV file. During the creation, you can choose the fields to be converted from the address book and the software will map accordingly in the output. Yes, there is a way to do so, i.e. 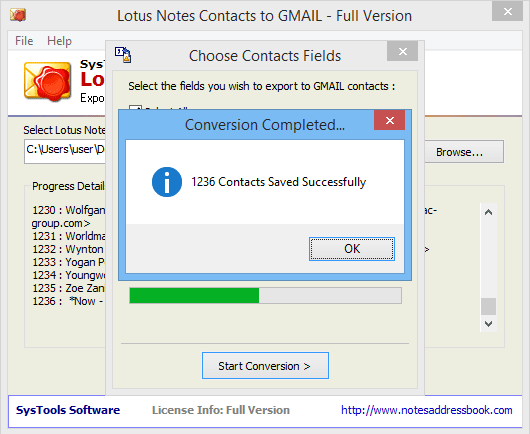 with the help of Lotus Notes to Gmail contacts converter. The product is programmed to support conversion of unlimited contacts. It is tested with the conversion of more than 10,000+ contacts. 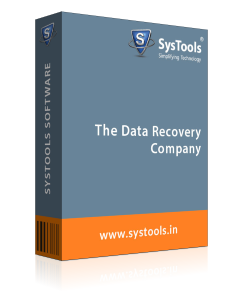 Therefore, the conversion of 2000+ contacts can easily be carried out with the software. 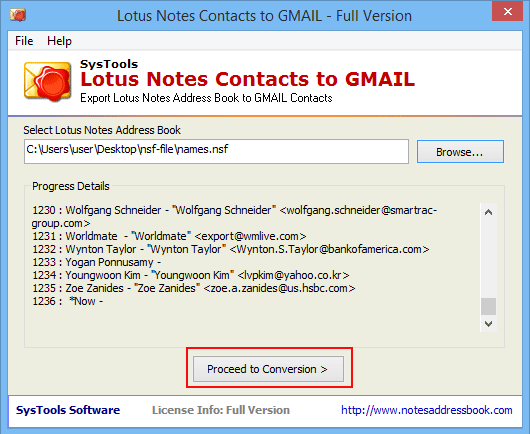 How to Convert Lotus Notes NSF to Gmail CSV? 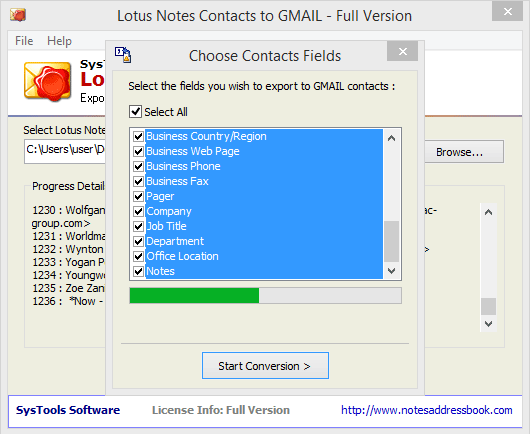 Step 1 : Firstly install the lotus notes contact to Gmail converter tool, then open it. Step 2 : Go to browse option and click on it. 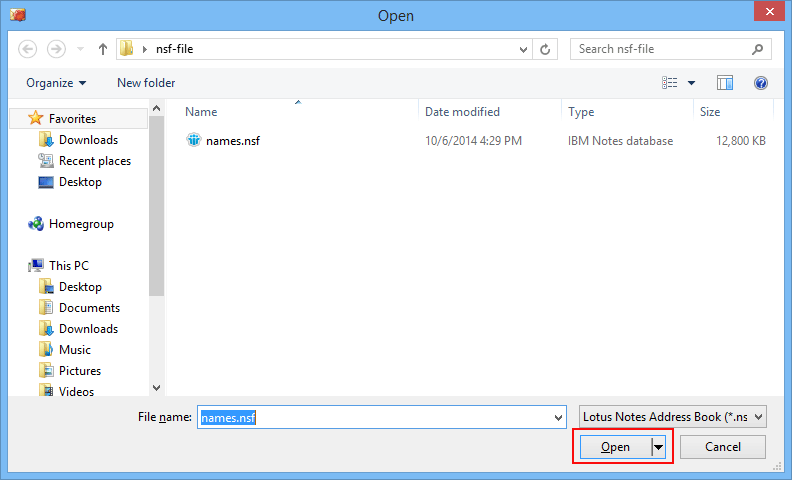 Step 3 : Now select the Lotus Notes .nsf file and click on open button. Step 4 : The software will start scanning it. When scanning process complete then click on Ok. Step 5 : After competition of process, the software will show all progress details. Click on OK to convert the NSF file. Step 6 : Select the contacts which you want to export to Gmail contacts, then Click on “Start conversion”. Step 7 : Now select the path where you want to save the converted file. Step 8 : The scanning process will begin. Step 9 : When Conversion complete successful, click on OK.
Open your Gmail Account and select the drop down menu for Gmail and select Contact option. Step 11 : When you select contact option, then click on More option and click on Import tab. Step 12 : Now choose GMAILContacts.csv file and click on import option. Step 13 : Now you can view the imported contacts in the Gmail contact list.